Just five weeks after the bombing of Pearl Harbor, Commisioner Kenesaw Mountain Landis sent a handwritten letter to President Franklin Delano Roosevelt. Roosevelt, in what became known as “The Green Light Letter,” responded to Landis the next day. Woodrow Wilson did baseball no favors during World War I. Wilson’s “work or fight” order forced the 1918 season to end on Labor Day. That year’s World Series, between the Boston Red Sox and Chicago Cubs, was played in early September. The first president to host organized baseball teams at the White House was Andrew Johnson who met members of the Washington Nationals and Brooklyn Atlantics at the executive mansion on Aug. 30, 1865. The Cincinnati Red Stockings, baseball’s first all-professional team who completed an undefeated 1869 campaign, were honored that year at the White House by President Ulysses S. Grant. The first world championship team to be feted at the White House were the 1924 Washington Senators who paid a visit to President Calvin Coolidge the following year. The world champion White House visit became an annual tradition during the Ronald Reagan administration. The Chicago Cubs – then known as the White Stockings – first visited the White House to see President Grover Cleveland following their offseason world tour in 1889 and paid their second visit to the White House last week during the final days of Barack Obama’s stay in office. Benjamin Harrison, the 23rd president of the United States, was the first commander in chief to attend a major league game while in office when he witnessed the National League’s Washington Senators loss at home to the Cincinnati Reds on June 6, 1892. Harrison also attended the Senators’ game 19 days later when they lost to the Philadelphia Phillies. President William Howard Taft started a baseball tradition on April 14, 1910 when he attended Washington’s season opener against the Philadelphia Athletics at Griffith Stadium. Taft threw out the ceremonial first pitch before the game from his front-row seat and then stayed to watch Walter Johnson shut out the Athletics, 3-0. Legend has it that the portly Taft, who tipped the scales at over 300 pounds, was feeling cramped in his seat. He stood up to stretch his legs midway through the seventh. Out of respect, other spectators also rose to their feet. The tradition of the “seventh inning stretch” was born. Since Taft, every U.S. president, with the exception of Jimmy Carter, has thrown a ceremonial first pitch on Opening Day. FDR owns the record with eight ceremonial first pitches between 1933 and 1941. Warren G. Harding and John F. Kennedy did not miss an opener during their three years in office. On April 10, 1961, Kennedy attended Washington’s opener against the Chicago White Sox and was the guest of broadcaster Vince Lloyd on WGN-TV’s pregame “Lead-Off Man” show. By that time, the ceremonial first pitch tradition had evolved to include two balls. The second ball was sent to the White House as a presidential souvenir. The first ball was a free-for-all. Players from both teams lined up in front of the presidential box. The president threw the ball into the crowd of players, like a groom hurling the bride’s garter into a crowd of bachelors at a wedding reception. The player lucky enough to catch the ball got to keep it. Kennedy’s toss in 1961 was hauled in by Jim Rivera. 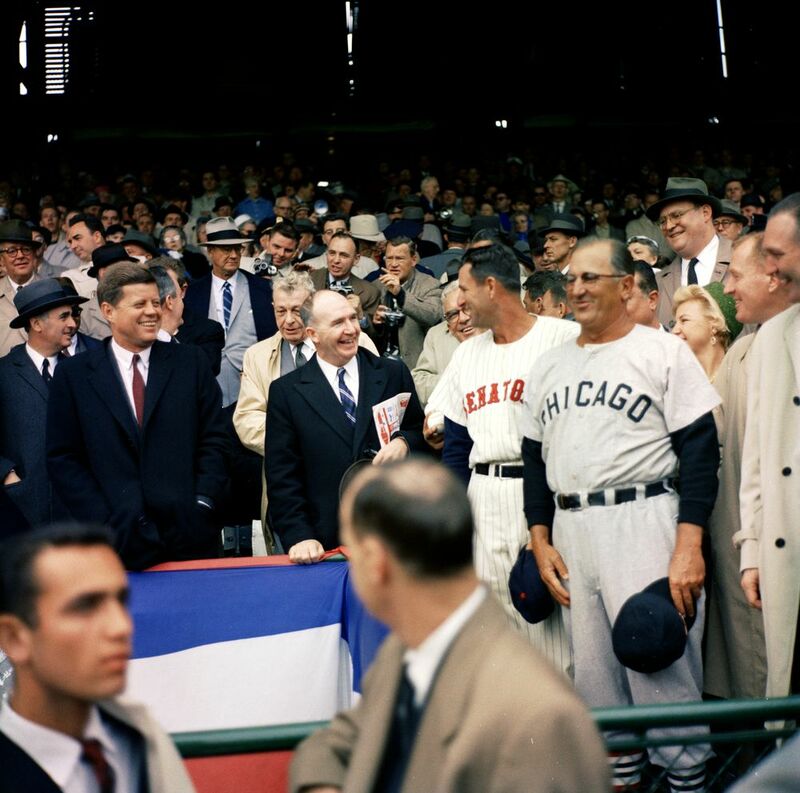 The White Sox outfielder approached the presidential box and asked JFK to sign the baseball. The president sloppily scribbled his autograph on the ball and handed it back to Rivera. White Sox trainer Ed Froelich, recalling the occasion years later to the Chicago Tribune’s David Condon, remembered that Rivera, upon inspecting the ball, barked at the president. Rivera shoved the ball back into Kennedy’s hands. “Take this thing back and give me something other than this garbage autograph!” Rivera exclaimed. Froehlich remembered that Kennedy laughed hysterically and wrote “JOHN F. KENNEDY” on the ball in big block letters. President George Herbert Walker Bush – who was the captain of the baseball team while he attended Yale – attended all four Baltimore Orioles home openers during his one term in office and Herbert Hoover was a perfect 4-for-4 in attending Senators’ opening days during his time in office. Harry Truman and Dwight Eisenhower each attended seven Washington opening days during their presidencies. Gerald Ford had the ceremonial first pitch honors at the 1976 All-Star Game in Philadelphia during the nation’s bicentennial celebration. President Reagan, who once broadcast Chicago Cubs games for Des Moines, Iowa radio station WHO, showed up at Wrigley Field for a late-season game between the Cubs and Pittsburgh Pirates on Sept. 30, 1988. Reagan donned a Cubs jacket, strolled out on the field and from several feet in front of the pitcher’s mound, fired a pitch to Cubs catcher Damon Berryhill. Series (still from Fox broadcast). One of the highlights of George W. Bush’s presidency came in the wake of the 9/11 terrorist attacks when he let loose the ceremonial first pitch at Yankee Stadium on Oct. 30, 2001 before Game 3 of the World Series between the New York Yankees and Arizona Diamondbacks. Bush, who wore a bulletproof vest beneath a New York Fire Department jacket, walked out to the mound and gave the crowd a thumb’s up before firing a perfect strike to Yankees shortstop Derek Jeter. As Bush, who once was a managing partner of the Texas Rangers, warmed up in the tunnel beneath the stands, Jeter warned the president to not bounce the ball. “They will boo you,” Jeter told him. It was an emotional and powerful moment. President Obama handled ceremonial first pitch honors at the 2009 All-Star Game in St. Louis, at the Washington Nationals’ home opener in 2010 and before last year’s historic exhibition game in Havana between the Tampa Bay Rays and the Cuban national team. “We do a lot of tough stuff as president,” Obama told ESPN. “And by definition you don’t end up being president if you don’t handle stress well. [But] nothing is more stressful than throwing a first pitch. Oregon State’s 12-2 victory over Mississippi State on Friday set the stage for this elimination game. The winner will meet Arkansas in the best-of-3 championship. 1917: Boston starting pitcher. Babe Ruth was ejected in the first inning after walking Washington leadoff hitter Ray Morgan. Ernie Shore relieved Ruth. Morgan was caught stealing second and Shore retired the next 26 hitters he faced to complete a 4-0 no-hit Red Sox victory at Fenway Park. Cubs broadcaster Jim Deshaies, a left-handed pitcher who won 84 games in a 12-year major league career (1984-95), was born in Massena, N.Y. on June 23, 1960. Rod Beck, an All-Star relief pitcher who earned 286 career saves in a 13-year major league career (1991-2004), was found dead at his Phoenix home by police officers responding to a call on June 23, 2008. He was 38. The cause of death was not publicly released by the Maricopa County coroner’s office. Beck saved 48 games for the San Francisco Giants in 1993 and 51 games for the NL wild-card winning Chicago Cubs in 1998. Baseball Daily Create a free website or blog at WordPress.com.